It is only going to take you one entry into this list to realize that Frank Castle is not like your everyday hero. The dude is a relentless beast, who often shows little remorse but is not afraid to carry a big gun. With enemies falling to his might in countless ways, the only real question isn’t who Frank is going to kill, it’s how many. The character made his debut in 1974, with the intention of going after and murdering one of the most popular characters out there, but more on that below. While he was not successful in killing that character, he sure as hell was in the comic series “The Punisher Kills The Marvel Universe” because, you know, he kills The Marvel Universe. If you think that image above of Wolverine getting electrocuted is bad, just wait until you find out about all the different brutal ways that Frank disposed of some of your favorite heroes. 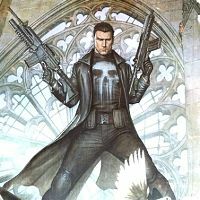 That storyline, as well as some of the most unique crossovers out there, including a rap star and Archie, help add to the unique and captivating nature of The Punisher. Frank Castle is going to start getting a lot more attention after his appearance on the second season of the Netflix series Daredevil but he deserves it. As you’ll learn by the end of this list, one thing is for sure: he’s one of the most powerful and ruthless heroes out there. That makes him one that is well worth learning about. When Marvel started to move towards some more explicit comics, they came out with the brand MAX Imprint. This ended up being a very big thing for The Punisher, who, as you know, is all about pushing the envelope. The series started in 2012 and ran for 22 issues. 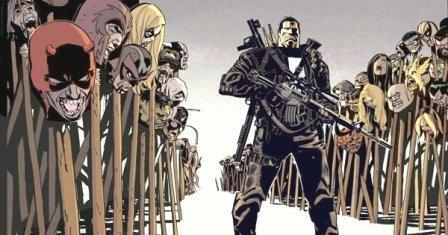 In the comic, it follows The Punisher who had been doing his thing for over 30 years. As you can imagine, that’s going to lead to quite a body count. How about a body count of, oh, I don’t know, 2,000 people?! The series ends with Frank Castle managing to kill The Kingpin, but succumbs to his own wounds from the battle.